Finally a few sunny days and even the first pick nicks of 2016! Also very happy with my new Marc Johns book. Wearing: t-shirt, Alternative Apparel – bracelet, A la – small purse, Solmode – cap & jeans, H&M – sandals, Birkenstock – straw bag, vintage. Book: The Daily Artist by Marc Johns. Author MangominiPosted on May 21, 2016 Categories Illustrations, What I woreTags 2016, Birkenstock, book, Cindy Mangomini, cute, daisies, denim, drawing, fashion, fashion drawing, fashion illustration, hand drawn, illustrated life, illustration, jeans, Mangomini, ootd, personal style, plant, Solmode, spring, spring 2016, streetstyle, style, the daily artist, vintage bag, What I wore, what i wore in drawings, What i wore today2 Comments on May, so far. This weekend the sun was back so I spent most of the weekend picnicking near the river with lovely food, wine and friends. 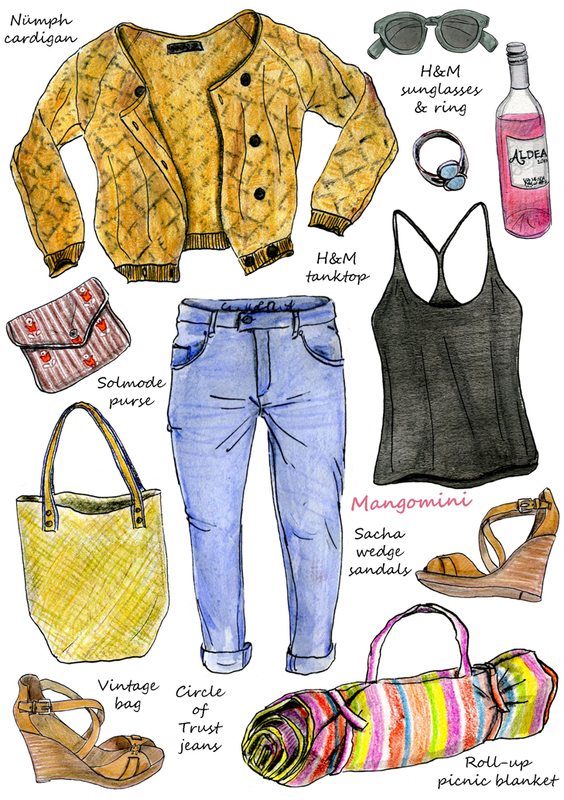 Author MangominiPosted on March 31, 2014 Categories What I woreTags boho, Cindy Mangomini, Circle of Trust jeans, cute, cute drawing, denim, drawing, fashion, fashion illustration, H&M, illustration, jeans, Mangomini, Nümph cardigan, picknick, picnic, picnic blanket, picnic illustration, Sacha wedge sandals, Solmode, spring, style, summer, vintage bag, weekend, What I wore, What i wore today, What i wore today in drawings, wineLeave a comment on Picnic weekend!